Did you know that ALL cats and dogs are likely to get worms throughout their lives? Not all worming products are the same and we can ensure that you use the correct products for your pet. 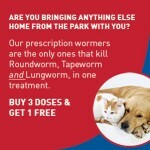 That is why the Oaks is offering a great deal on our wormers that kill roundworm, tapeworm and lungworm. We are offering you 4 wormers for the price of 3 per pet. This is a great deal for owners of dogs that scavenge and cats that hunt, allowing you to protect your high-risk animals from lungworm, roundworm and tapeworm monthly. You may have heard that lungworm is a particular problem for dogs in this area of the country. It is carried by slugs and snails and can cause life-threatening illness such as blood-clotting disorders, neurological problems and heart and lung disease. We are seeing cases at this practice and there have been deaths at other local practices so we urge you to ensure that the wormer you use gives your dog cover for lungworm, as well as roundworm and tapeworm. Please contact us by phone or come down to the practice to take advantage of our worming offer. We’re based in Bournville, and are ideally placed as vets for customers looking for vets in Quinton, Edgbaston, Harborne, Kings Heath and Harborne. We are also emergency vets for the whole of the Birmingham area. So wherever you are in Birmingham, give us a call or come and see us today.